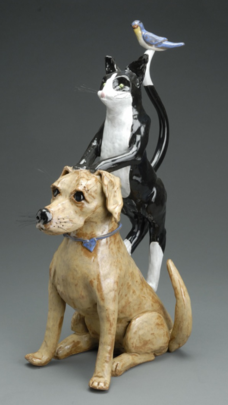 Whimsy, humor, color, function and fun – a few words that only begin to describe the ceramic art of Alexis Moyer. Following college, Moyer visited Crete to study Minoan art history and ceramics. “I was very fortunate to have that experience. All these years later, I see how much my love of color came from that formative time.” Her signature blue glazes are clearly inspired from her time in Greece. provided and forts from construction scraps scavenged from projects around the neighbor- hood. “My neighbor and I built what ever we could dream up in my back yard,” Moyer recalls which eventually led her to take on the building of her own art studio in Pescadero, CA. She remembers it as a rewarding experience but found it was a much tougher job to do the actual construction than it was to design build- ings on paper. Moyer now lives in Philo, enjoy- ing the relaxed pace of life in the country. some of my more complex pieces.” Moyer has observed that when someone finds their special mug, they often hold it next to their heart. “You watch their hand fit where my hands were. 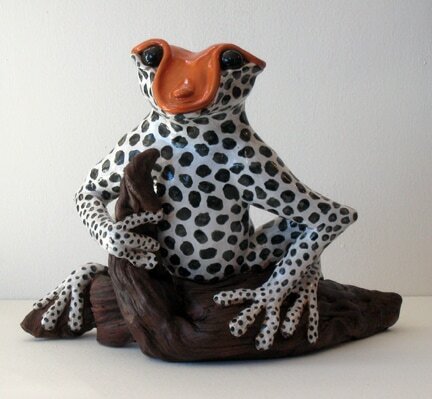 It’s very special, you really can feel where the artists fingers traveled over the clay”. She likes to think that a little piece of the potter’s spirit stays with each piece. “I know for myself there is a tangible connection when I look at ancient pottery in museum collections. If they would let me hold one of those objects I’d close my eyes and run my fingers along the ridges and be transported back in time to some long lost era,” Moyer observes. Moyer’s style is on the whimsical side. She derives a lot of pleasure seeing people smile while they are looking at her work. “There is a theory that when you smile your outlook changes in a positive way so that is my little gift to everyone who comes across my work,” says Moyer. It is also one of the reasons she enjoys welcoming visitors into her studio. People can meet her, watch how the work is made and get to see the whole process. ress, racks of glazes, books, sketches and of course, her kick wheel and kiln. Projects from life-sized sculptural pieces to her signature dinnerware are spread on shelves, awaiting firing. Moyer enjoys showing visitors her works in progress and describing how the works will evolve as they progress. It is not unusual for visitors to return several times during the time a piece is being built to see how it is coming and to watch for the finished piece to show up on The Pot Shop’s Facebook page. “I always have two bodies of work going– a functional body of work and my sculptural pieces. 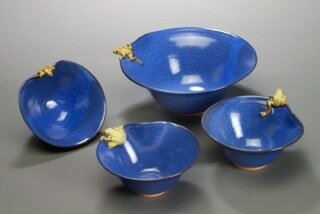 The functional pieces help fill up the kiln, which brings my studio into balance” Moyer explains. She also feels that the func- tional works have led to the honing of her skills, providing the 10,000 hours of practice that lead to mastery. Frankly she says the first 10,000 hours are only the beginning and that the more she pushes what she wants to make the more practice it takes to make it happen. ects like that stretch my skills and challenge me,” she says. As with all creative endeavors, Moyer insists on having the creative freedom needed to do her best work and create spec- tacular results for her collectors. Moyer enjoys teaching workshops working with all skill levels. She especially enjoys help- ing new comers to clay discover their own creativity. “It is humbling to take art classes. You discover something about yourself and what it takes from you to create a piece of art.” Classes with more advanced students seem to generate a symbiosis that leaves everyone making things they never thought possible when the class began. Friendships are formed and there is a camaraderie that is unique to the arts. The largest body of Moyer’s work is found at The Pot Shop. 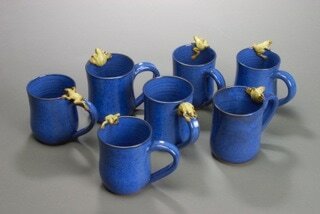 Her work is also shown at several galleries and art fairs throughout north- ern California. She is widely collected and her work has been published in Ceramics Today, California Association of Clay and Glass Artists, Artists of the Mendocino Coast, and the Men- docino Travelers Guide and Mendocino Arts magazines.